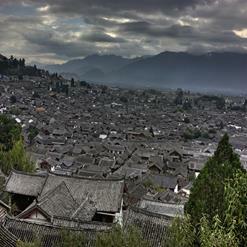 The palace where the Mu Clan of the Naxi people ruled for over 400 years. It is a large complex that extends part way up the hill behind it. There used to be a lot of high quality paitings in the palace and finely carved wooden doors, but most were destroyed during the Cultural Revolution.